CellTrust Secure SMS - SST Group Inc.
• Secure SMS/text messaging up to 5,000 characters, secure two-way multi-channel paging, secure interactive text messaging, secure voice calls, and secure email. 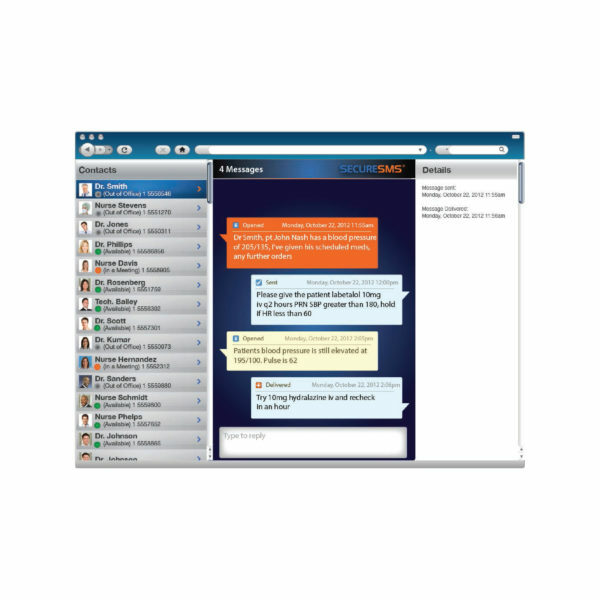 • Geo-fencing allows you to automatically disable employee’s personal (non-secure) texting in your facility. • Device registration through two factor authentication verifying both the handset and the user. • User friendly, interactive, web-based, Operator/Nursing Portal with ActiveSync® technology keeping contacts secure and up-to-date. 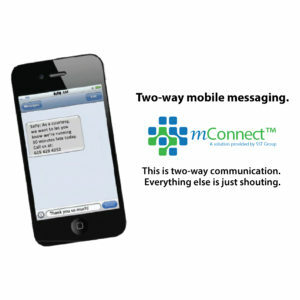 • Mobile device user control of current availability and customizable favorites and groups. • Integration of Active Directory or LDAP technology on all corporate liable mobile devices and operator portals allowing for the ability to quickly access individuals or pre-defined groups. • HIPAA compliant AES 256 bit end-to-end encryption. Data at rest or in-transit are fully encrypted with unique dynamic keys. • Validated proof of delivery, opened/or deleted, audit trails and traceability for regulatory compliance. • HIPAA compliant archiving services for application to device, operator to device, and device to device. 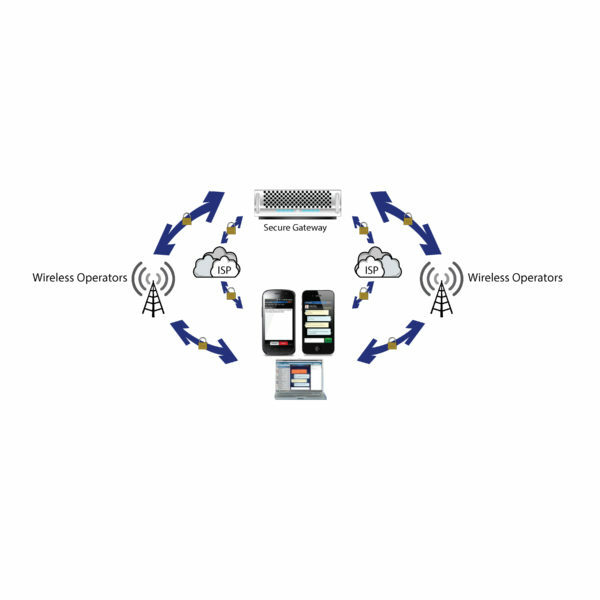 • Policy based administrator control of network including remote wipe, inactivity time-outs and lifespan control for messages residing on devices. • For mission critical information, the encrypted communication is securely delivered via a secondary control channel for redundancy and failover when the data channel is unavailable or the signal is weak inside hospital “dead spots”. • API’s available to integrate with third party providers. 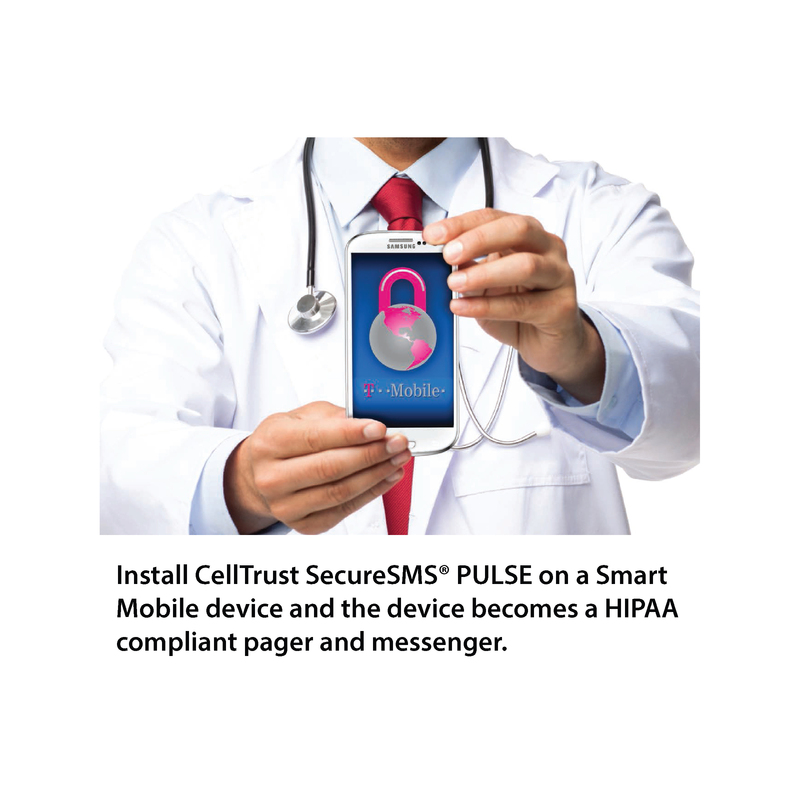 CellTrust SecureSMS PULSE is a HIPAA compliant secure mobile communication solution featuring CellTrust’s secure messaging and SmartPager™ technology to provide Healthcare professionals with a single Corporate Liable device. CellTrust SecureSMS® PULSE has been engineered specifically for healthcare on the CellTrust SecureCore™ -comprised of the Secure Mobile Information Management (SMIM) Platform, global SMS gateway, and a suite of secure mobile applications. CellTrust’s HIPAA Compliant Communication Integration Server (HCCIS) resides within the CellTrust SecureCore providing a safe, redundant, auditable, and traceable means to protect mobile PHI communication inside or outside the healthcare environment. HCCIS enables Healthcare professionals to communicate patient information via secure two-way paging, secure SMS/text messaging, secure voice calls, and secure email via a user friendly, interactive, web-based Operator/Nursing Portal with ActiveSync® technology. Additionally, HCCIS provides archiving services for application to device, operator to device, and device to device. A web-based portal requiring a secure login is used for configuration and management. The Secure Gateway can be hosted on your premises or by a provider. CellTrust SecureSMS® PULSE SmartPager technology also uses Data/WiFi for redundancy bringing an end to the days of “Page and Pray”. 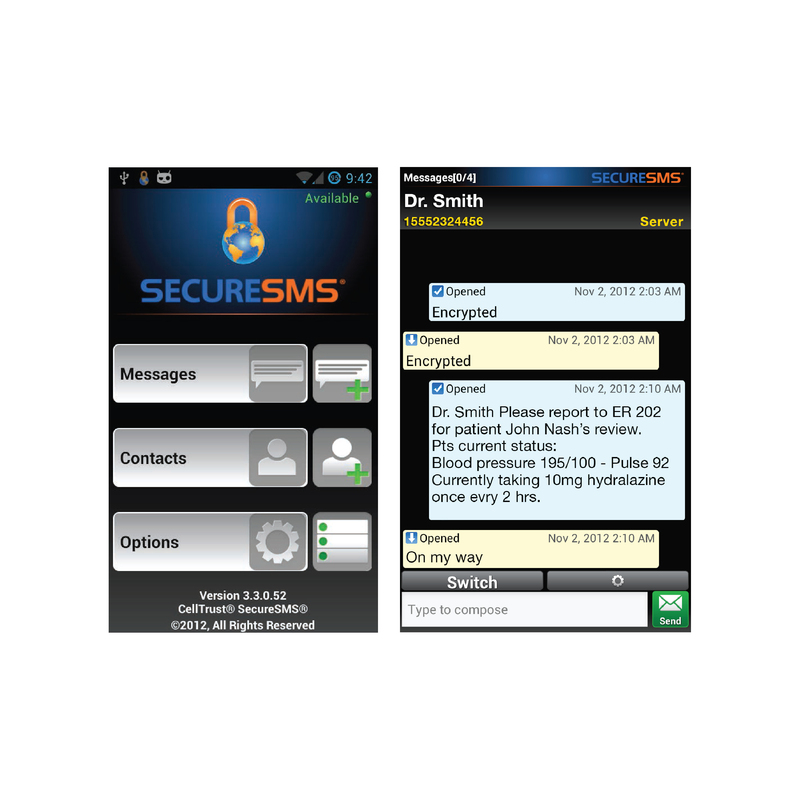 CellTrust SecureSMS’s patent pending ability to send encrypted SMS messages over Data/WiFi compensates for hospital “dead spots” and delivers one of the highest levels of reliability in the healthcare industry. 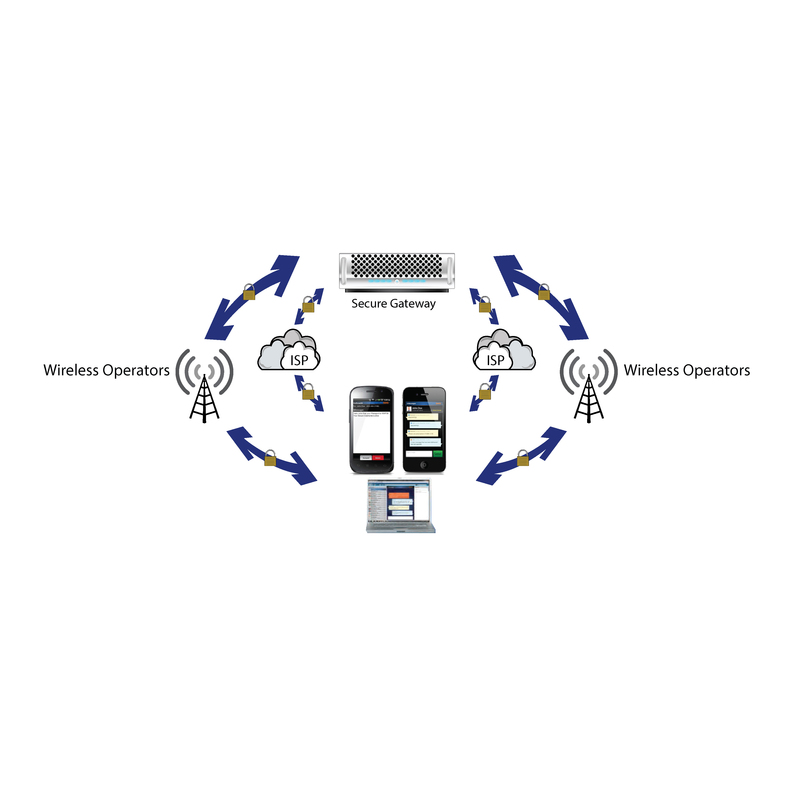 CellTrust SecureSMS® PULSE provides resilient, persistent, paging over a redundant, dedicated, carrier critical control failover channel, to ensure the page or message arrives when it should.